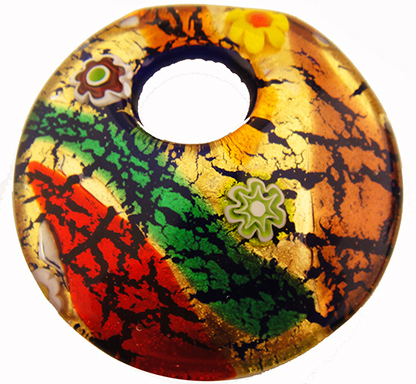 Authentic Murano Glass Fused Pendant featuring 24kt gold foil and Murano Millefiori. The hole is approximately 5mm. The size of this Murano Glass Pendant is approximately 50mm (2 inches) in diameter. These pendants are fused with 2 plates of Moretti glass and in the middle of the sandwich is 24kt gold foil and our millefiori. These pendants are slumped after the fusing to give them slighty curved shape which helps hold the pendant close to the body and sits on the cord nicely. You need only add a simple cord or chain to have a beautiful piece of Venetian Glass Jewelry.